Today, April 25, New Zealand and Australia observe Anzac Day, the anniversary of the landing of the Australia and New Zealand Army Corps (ANZAC) at Gallipoli in Turkey (1915). From the commemoration of that ill-fated campaign, the day grew into a commemoration of all service personnel who died for their country, as well as honouring returned personnel. 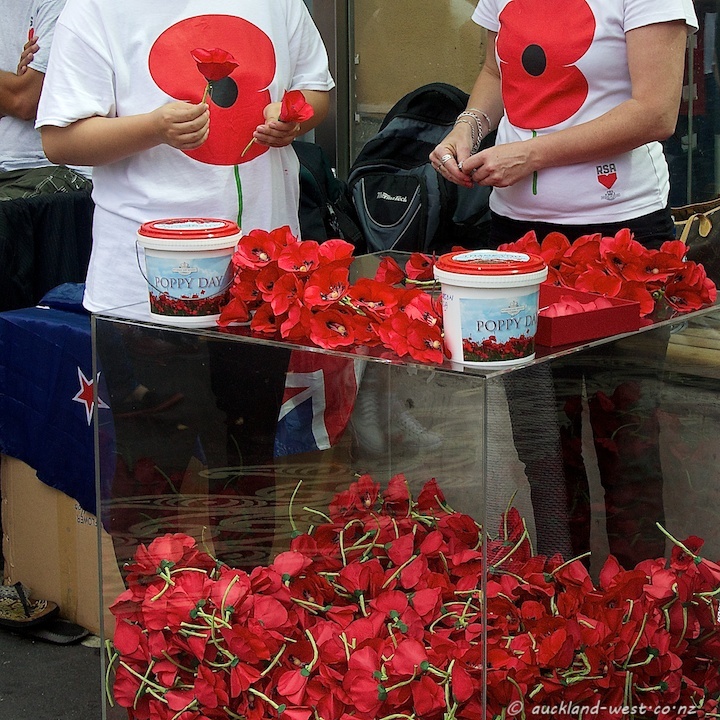 Poppy Day is usually the Friday before Anzac Day, but this year was on the Thursday (because of Good Friday). On Poppy Day RSA volunteers offer poppies in exchange for a donation, the major fundraiser of the RSA for their welfare work with returned service personel. 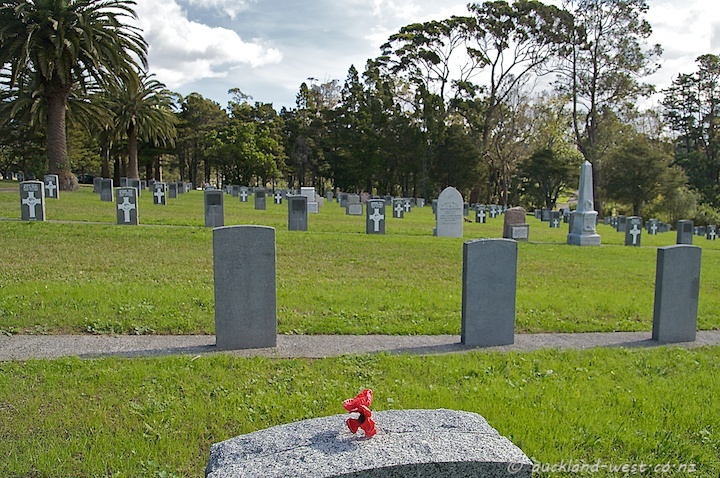 On my visit to the Waikumete Services Cemetery last Thursday, I found these poppies wedged between two headstones. 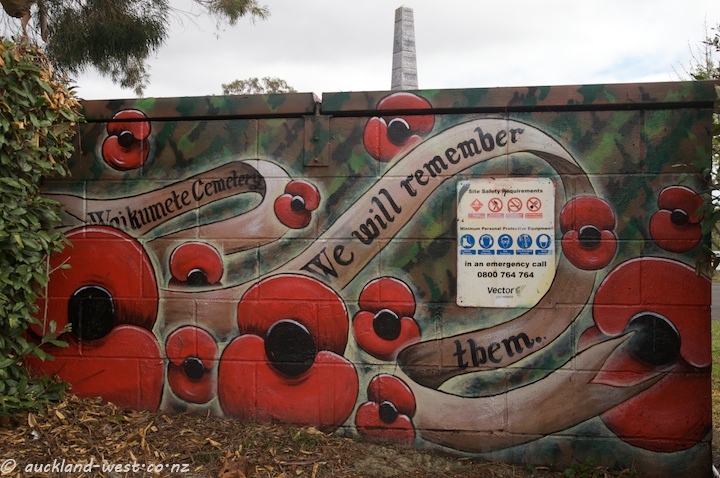 April 25 is Anzac Day, a day of commemoration in Australia and New Zealand. On this day in 1915, the Australia and New Zealand Army Corps (together with other troops) landed at Gallipoli (Turkey), the beginning of a disastrous campaign with huge loss of lives. 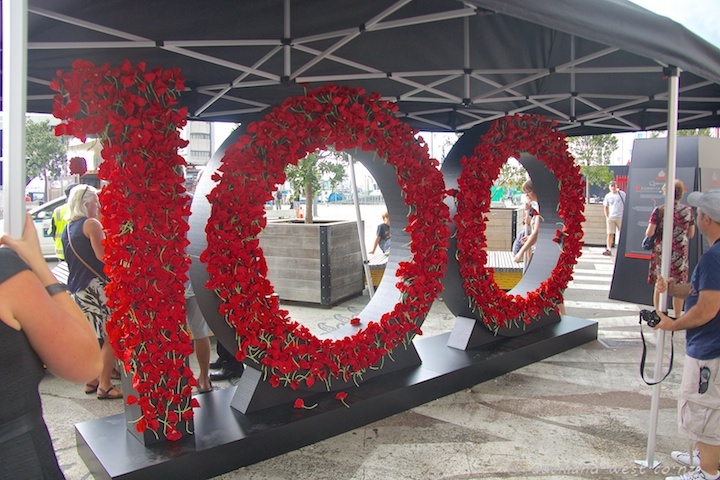 The Poppy Wall shown here was assembled when the Cunard Liner “Queen Elizabeth” was in port at Auckland on February 27 this year. 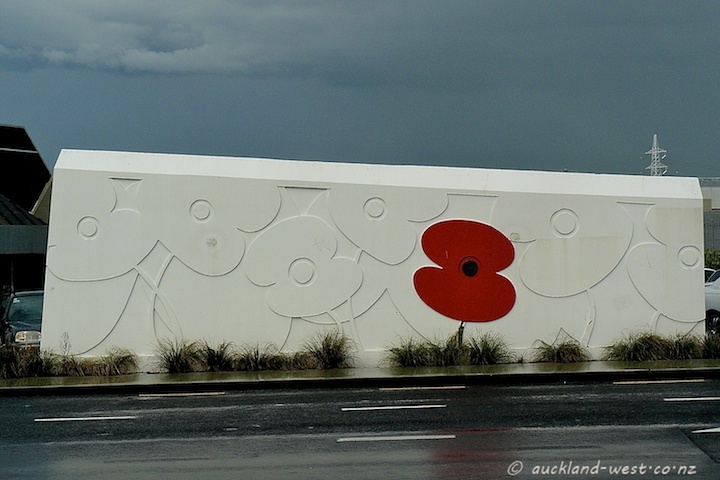 Her world cruise lead past Gallipoli Peninsula last night, April 24, and a commemorative service was scheduled aboard the ship, this Poppy Wall forming the centrepiece of the occasion. 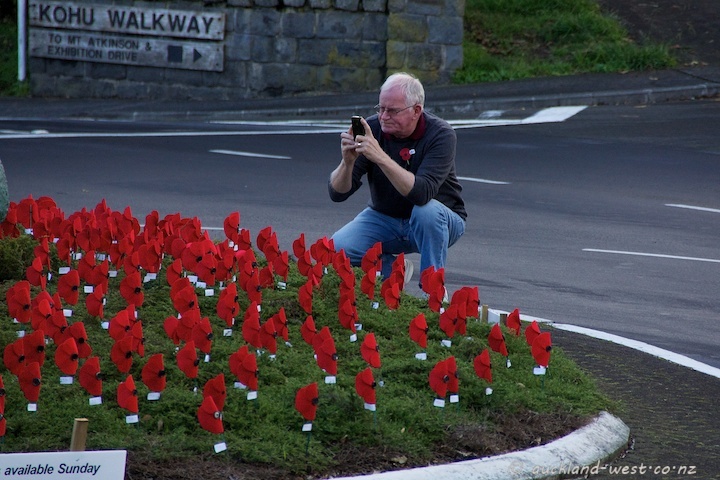 While the scope of the Anzac Day Commemorations has widened over the years to include the memory of all fallen in armed conflict (and honouring those who returned), this year the events of Gallipoli and World War I are much more in the foreground. 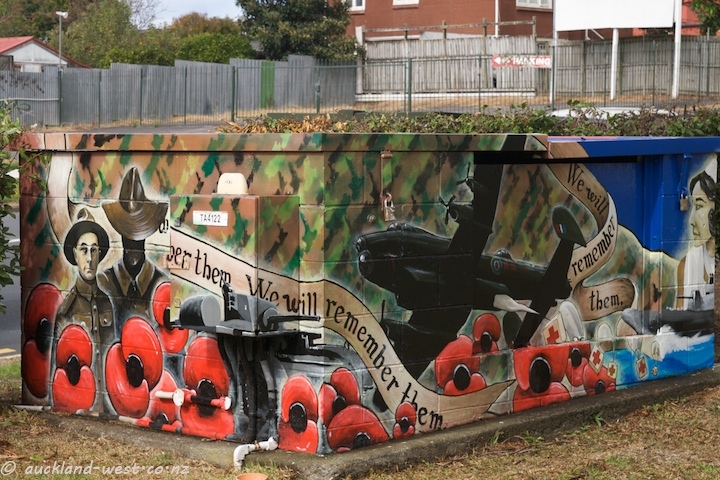 The poppy has become very much a symbol of commemoration, see earlier posts. 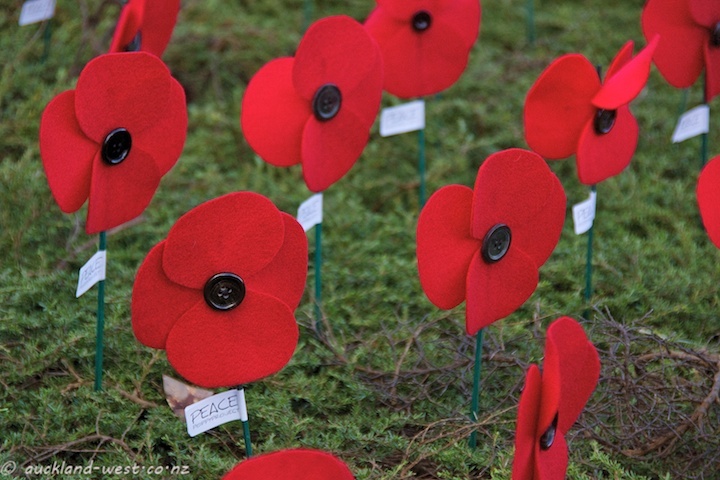 In New Zealand and Australia, April 25 is a day of remembrance (Anzac Day). Originating with the ill-fated landing of the Australia and New Zealand Army Corps (ANZAC) at Gallipoli (Turkey) on April 25, 1915, it is now a day of more general commemoration of those who died in military action. 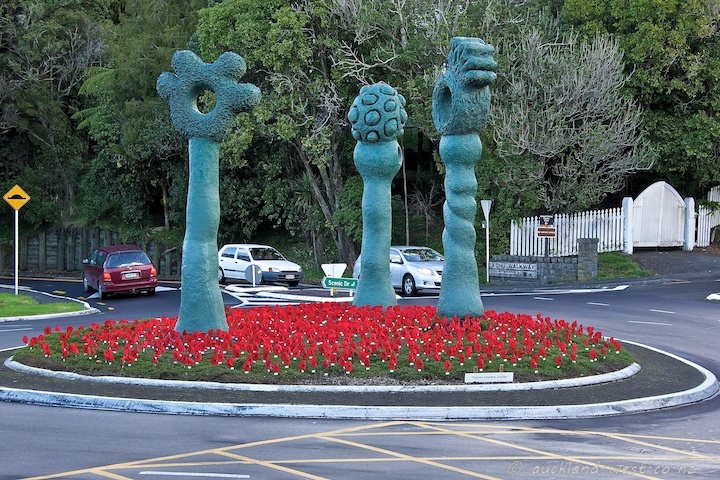 This oversize box is at the Glenview/Great North Roads corner of Waikumete Cemetery and prominently features the poppies which are sold in the preceding days to raise funds for veterans’ charities. Apart from the poppies (which evoke the World War I battle fields of Flanders), we see soldiers and nurses as well as military hardware. Behind the box in the picture above one can see the cenotaph which is the focal point of the adjacent servicemen’s cemetery. A dawn service by candlelight will take place here at 6 a.m. on Sunday 25 April. The artwork is by Dan Mills. More work by Dan Mills.